A Writer not Keen on Writing… – Whats your superpower? Wouldn’t it be great to free ourselves of any doubt? Freedom from doubt in EVERYTHING? In ourselves, in our beliefs, our fellowmen, the world, our thoughts, our decisions, our goals? We doubt ourselves and in so doing talk ourselves out of doing the things we feel drawn to. Like me sometimes with writing. I love to express through words…whether sharing an idea, teaching a class or writing. Yet often, I might have an idea for a post but instead of just getting to my laptop and hammering it out…see where it will take me….I overthink the idea. I research extensively. And before you know it, it’s the end of the day. I have not written anything and my original idea is watered down and unrecognizable. This is why we have cameras but don’t take pictures. We have beautiful voices but refuse to sing. We have a talent for doodling but think to ourselves “how can we every make a living off of that?” and so never allow ourselves time to doodle. What does freedom from doubt look like? No more fear of what you have been. No more fear of what you have done. No more worry. No more guilt. We are constantly questioning ourselves. I question myself all the time. It can be paralyzing. Overwhelming. Mentally debilitating. I have to remind myself to get out of my head and into my life. Take action. Do something. …this constant questioning of yourself and wondering what you’re meant to do can paralyze you. You can get stuck doing nothing. …we don’t often know what we should be doing until we start doing it. Experience leads to competence, and competence creates confidence. Until you’ve done a few things, it’s easy to hold back from committing to any certain path. It might, after all, end in failure. And there it is. The “F” word. Failure. It’s like when I have an idea for an article but let it go…because I am thinking about whether it will be a good article or not. And by good I mean that “people” will like it. Does that really matter though? The drive for approval? This just gets me down if my article is not “liked” enough. Is the purpose of my writing to get people to like what I am saying or to share and perhaps teach someone, something that I have experienced, observed or learned? There is a quote that I have as my screen pic “true artistic freedom is knowing that whether your work is loved or hated that you’re still gonna do it.” – author unknown. In 2010 author Neil Pasricha wrote The Book of Awesome, followed closely by two more books, selling more than a million copies in total. When I was stressing about my blog, watching hit counters, bestseller lists, and award nominations, I was using external motivators. I wasn’t doing it for me. I was doing it for others. I lost my self-confidence because I started outsourcing it to signals outside my brain, which I couldn’t always control. When those signals were positive, I was flying. Lots of emails, piles of comments, and bestseller list rankings lifted me up and kept me going. But when those signs were negative, even relatively negative, I was devastated. Critical comments, a nasty review, and the inevitable slipping off the bestseller list — meant I was a loser. The conclusion was obvious: Only internal goals truly matter. I need to remember the reasons why I write. Not to be judged by some external “they” but because something inside me bubbles up, an idea surfaces, and I need to write about it. There is a vitality, a life force, an energy, a quickening that is translated through you into action, and because there is only one of you in all of time, this expression is unique. And if you block it, it will never exist through any other medium and it will be lost. The world will not have it. It is not your business to determine how good it is nor how valuable nor how it compares with other expressions.It is your business to keep it yours clearly and directly, to keep the channel open. 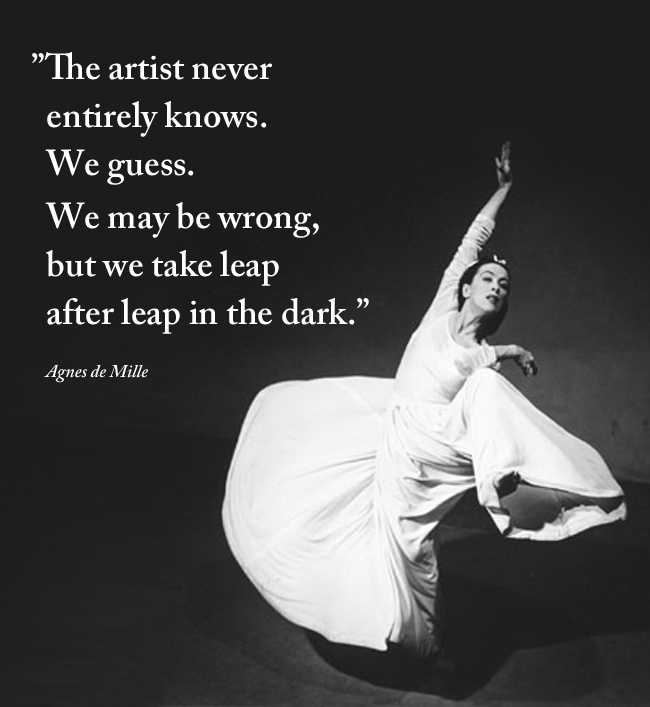 ….so said Martha Graham to Agnes De Mille, choreographer of Oklahoma. Whatever it is that you are here to do will not come through anyone else.